For the 1738 poem by Samuel Johnson, see London (Samuel Johnson poem). This image is a digital reproduction of his hand-painted 1826 print of "London" from Copy AA of Songs of Innocence and Experience. The item is currently in the Collection of the Fitzwilliam Museum. London is a poem by William Blake, published in Songs of Experience in 1794. It is one of the few poems in Songs of Experience that does not have a corresponding poem in Songs of Innocence. 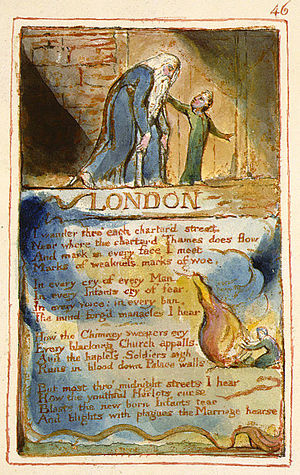 Blake lived in the capital city of London, which was the location for this poem. The poems reference the "Two Contrary States of the Human Soul". The "Songs of Innocence" section contains poems which reference love, childhood and nature. Critics have suggested that the poems illustrate the effects of modernity on people and nature, through the discussion of dangerous industrial conditions, child labour, prostitution and poverty. Songs of Innocence and Experience was originally hand-printed and illustrated by Blake in 1794. Blake suggests that the experience of living there could encourage a revolution on the streets of the capital. This could have been influenced by the recent French revolution. The use of the word "chartered" is ambiguous and goes against control and ownership. It may express the political and economic control that Blake considered London to be enduring at the time of his writing. Blake's friend Thomas Paine had criticised the granting of Royal Charters to control trade as a form of class oppression. However, "chartered" could also mean "freighted" and may refer to the busy or overburdened streets and river or to the licensed trade carried on within them. In the original draft, the word used was simply "dirty" ("I wander through each dirty street / Near where the dirty Thames does flow"). Blake makes reference to the "Blackening church" suggesting that the church as an institution is not only physically blackening from the factories of Victorian-era London, but is actually rotting from the inside, insinuating severe corruption. Blake created the idea of the poem from using a semantic field of unhappiness. This is presented through the verbs 'curse', 'cry' and 'sigh'. Ralph Vaughan Williams set the poem to music in his 1958 song cycle Ten Blake Songs. The poem was set to music in 1987 by Tangerine Dream on their album Tyger (album); the album is based on the poems of William Blake. ^ a b "BBC - GCSE Bitesize: Context". Retrieved 2018-08-24. ^ Stephen Bygrave (ed), Romantic Writings, Routledge, 1996, p. 20; Tom Paulin, "The Invisible Worm", The Guardian, London, March 3, 2007. ^ E. P. Thompson, Witness Against the Beast: William Blake and the Moral Law, Cambridge University Press, 1993, p. 176. William Blake's London by Lethargica. The Internet Archive. Retrieved 07/05/2008.